Happy August, friends! This is one of my FAVORITE months of the year, because it's my birthday month! And summer is still upon us, as we look towards fall. I just love it! I am ringing in August with Farley's Currently Link-Up! Here we go! I am loving summer! I finally got to the pool a week or so ago, and am planning more days like that soon! Our summer has been very mild, which has been great! I just finished a great book "And the Mountains Echoed" by Khaled Hosseini, and now I'm trying to decide which one to dive into next! I've been scouring Groupon, and researching a new laptop. Do I get one with Windows 7 or 8? Which brand? Etc. I'm pretty set now, just waiting for the right one to come along! Oh, my discipline at the gym has been lacking. I need to get back on the ball! As far as Back to School musts, a planner is at the tippy top of my list. I have to have a physical one to keep me organized! I'm a school supplies addict, so organization there has to be present. I'm hoping to make a Teacher Toolbox SOON! Also, great music is a wonderful way to set the tone and ambiance of your classroom. I'm finding some wonderful music on the Pandora Station for Edward Sharpe and the Magnetic Zeros! Do I have any fellow birthday month bloggers?! I'd love to work with you on a big giveaway to celebrate! I love Big Bang Theory! I mentioned it on my Currently. I also agree with you about a playlist, love Edward Sharp and the Magnetic Zeros. 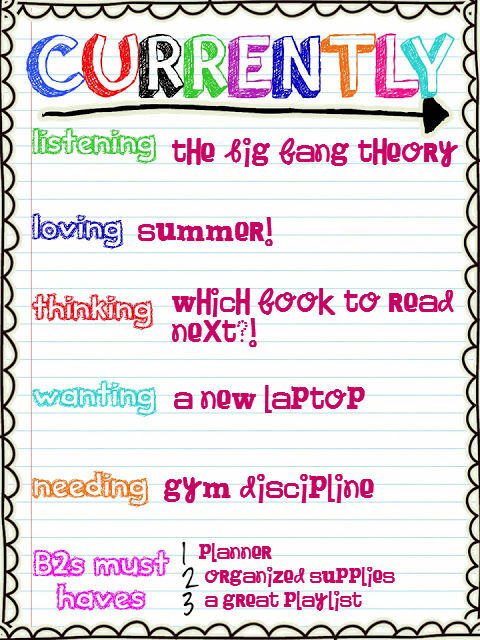 I love the Big Bang theory!! Have all the seasons... And can watch on repeat its so funny! I love finding great books to read! Some of my favorites are Little Bee and The Book Thief. Music is such a great way to set the tone in a classroom- I'm definitely checking out your suggestions.